I adore these cookies. So much so that they are dangerous in my presence! I only allow myself to make these when I have company. It's the only time I am able to show a little restraint. These cookies are to die for! You are right, Martha has definitely done it again! I have her book too and the recipes look great! Glad that you have made two winners already! I have made these and they are oh, so good. Your cookies look beautiful! These are just beautiful. 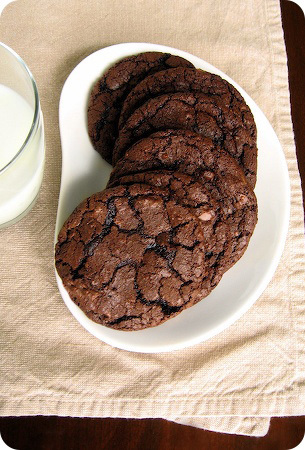 I love chocolate cookies. These cookies are excellent. They taste just as they were described. I did bake them for 11 minutes and it's the perfect time. They are being packed away for a fishing trip to Ocracoke, NC and I will eat their chocolate goodness while swishing my toes in the sand. I love the website. ~madeline~ I am glad to hear that I'm not the only fan of these! my sweet and saucy, I have to say that I think that this book will be one of those that you check for inspiration quite often; it is a great resource for things like bake sales and gifts. patricia scarpin, thanks for saying! onehaven, I cannot recommend them enough they are so simple to make and yet so rewarding. I will admit though, I might make them with some semisweet or bittersweet chocolate in the future, as that is my personal preference. kelly-jane and sheltie girl, thanks for the compliments. susan updike, I do hope you have a fabulous time on your fishing trip. Even if your line doesn't get any nibbles, you can at least nibble on these. Thanks for the kind words. Just to let you know, i tried your recipe and they taste really good..
My kids loved them. Thanks for the post..